The outcome of the presidential election caused bank stocks to soar last month. November was a great month for bank stocks, and JPMorgan Chase (NYSE:JPM) wasn't left behind. Shares of the nation's biggest bank by assets climbed 16% last month, ascending to the highest price in the company's history. There are two ways to put JPMorgan's performance last month into perspective. The first is to compare it to other bank stocks. You can do this by looking at the KBW Bank Index, which tracks the two dozen largest publicly traded banks in the country -- excluding stand-alone investment banks such as Goldman Sachs and Morgan Stanley. 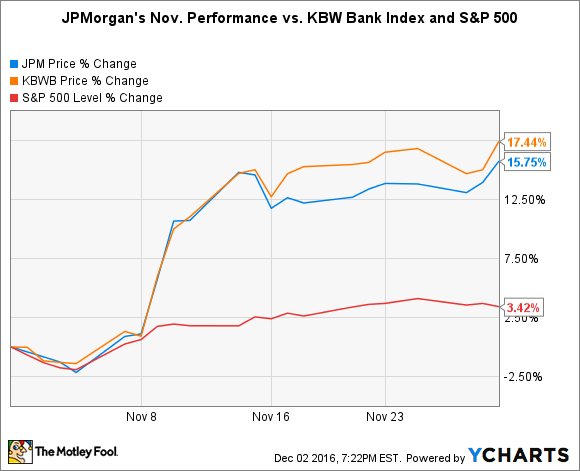 The KBW Bank Index narrowly outperformed JPMorgan Chase in November, rising by more than 17%. This isn't because the prospects at other banks improved more than at JPMorgan Chase. It's rather because most of the other banks on the index were either smaller, such as M&T Bank and KeyCorp, which makes those stocks more susceptible to fluctuations, or went into the month at a lower valuation, such as Bank of America and Zions Bancorporation. JPMorgan Chase, by contrast, was considered to be one of the most efficient and stable banks going into the month. This was reflected in its premium valuation, leaving much less unrealized upside. Not to mention, as I've already alluded to, it's the biggest bank in the country, which means that its stock isn't as susceptible to massive and rapid fluctuations. The other way to put JPMorgan Chase's stock performance from last month into context is to compare it to the broader market -- namely, the S&P 500, which tracks shares of 500 large-cap companies based in the United States. The S&P 500 climbed a mere 3.4% in November. That obviously pales in comparison to JPMorgan Chase's gain. The question, then, is why did banks, including JPMorgan Chase, outdistance the broader market to such a large degree? The answer stems from the outcome of the presidential election, as President-elect Donald Trump made two promises that, if honored, should dramatically improve profitability in the bank industry. First, he's promised to cut taxes and invest heavily in infrastructure projects. Both of these should spur not only economic growth, but also inflation. The latter, in turn, would incent the Federal Reserve to raise interest rates. And higher interest rates translate into higher profits for banks. This is because the principal product a bank sells is a loan, the price of which is dictated by prevailing interest rates. Higher rates equate to higher prices, which thereby translates into higher revenue for banks. The second thing Trump promised on the campaign trail is to reduce regulations in the bank industry -- more specifically, to dismantle the 2010 Dodd-Frank Act. There are a multitude of things this could encompass, including lower capital and liquidity rules, more flexibility when it comes to capital allocation, added freedom to run proprietary trading operations, and less oversight of consumer financial products. It's still too early to know exactly what Trump's team will accomplish in this regard, but any one of these things would translate into a win for banks and their shareholders. Consequently, while there's little doubt that Trump's ambitious plans to spur economic growth and roll back regulations would, if realized, be beneficial to a wide range of industries, few stand to benefit as much as banks. It's for this reason that bank stocks, in general, and JPMorgan Chase, in particular, had such an outstanding November.